Reminder: Ellora’s Cave has rebranded as EC for Books, so all posts will contain both the old and new branding in the first paragraph for a while. Since last October, EC for Books/Ellora’s Cave has completely reverted two New York Times and USA Today Bestselling Authors: Amanda Ashley and Lora Leigh. But one of the reasons it’s not easy to say how many authors or books there are, exactly, is the error rate in the metadata for things like: what authors’ names are, what the title of the book is, when it was published, and so on. Also, farther down, I’ll share spreadsheets of both the All Romance eBooks parsed data as well as the Amazon data I have, which will help both authors and Ellora’s Cave/EC for Books verify their data. First, I’d expect the number of books a publisher has for sale on two domestic markets to differ by less than 1%. Yet, when Amazon’s showing 2,744 books (with two different publisher names) and ARe is showing 2,929 on the same date, that’s closer to 6.3%…and that’s just the error rate for the number of titles. As someone with a weird name, I feel for Melani Blazer. She first showed up on Ellora’s Cave’s site in 2004, back when her name was correctly spelled. Same in 2013. Since the new site, however, it’s been Melanie. Reverted Title Still In Print Because of Author Name Typo? EC author Ann Jacobs has had a number of titles revert. One of those titles is Perfect Master, a title that reportedly reverted to Ann in October of last year. Here’s a screenshot I just made on All Romance eBooks, showing Ellora’s Cave is still publishing that title. Instead of looking for both the author name and the title, someone may have quickly checked the author name, didn’t see the book, and didn’t flag it for reversion. But because the name was incorrectly entered, the book was missed. There are a number of mis-entered names, and here are a few: Calista Arman (should be two Ls), Rhyannon Bryd (Byrd), Nora-Jean Perkin (should be Perkins), Moffitt. Jody (Jody Moffitt), Sierra Summer (Sierra Summers), and Jayme Whitfield (Jayme Whitefield). Here’s another issue that happens with All Romance eBooks—quirky date fields. I believe that there are a number of books where the publication date is null, and therefore appears as a publication date of December 31, 1969. 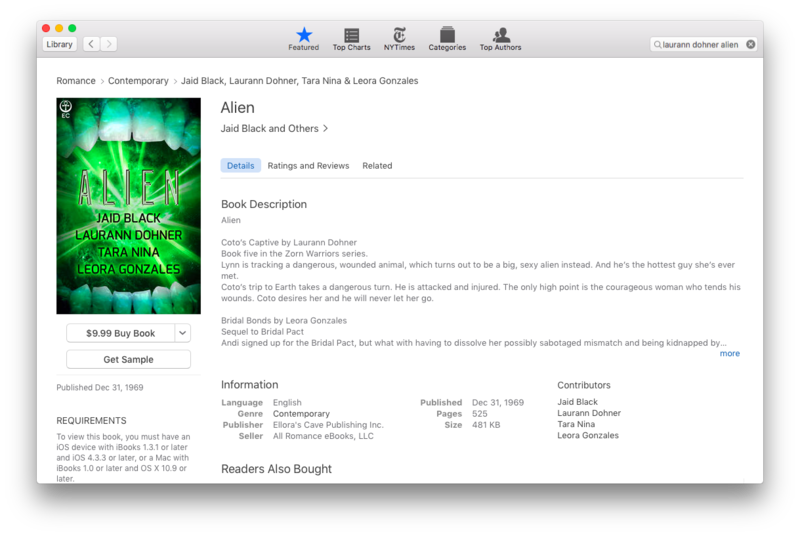 An anthology published on October 28, 2015 (where one Laurann Dohner story in it reverted at the end of March) is still being published on iBooks with that weird publication date. Then there are multiple versions of the same thing. ARe has both this version of Barbara Sheridan’s Bittersweet Surrender as well as this version of the same book—with no cover, but with exactly 10,000 extra words at the same price, if the metadata is to be believed. Then there’s the late Charlotte Boyett-Compo’s Desert Wind (WindWorld) at $0.99 vs. WindWorld: Desert Wind at a heart-stopping $13.98. See also N.D. Hansen-Hil’s Gilded Folly vs. Gilded Folly, also at a heart-stopping price. And Jeanne Savery’s Runaway Scandal vs. Runaway Scandal. And Charlene Teglia’s Yule Be Mine vs. Yule Be Mine. In other words, even though ARe lists 2,929 books for sale, there are somewhat fewer actual books for sale (2,917 books, actually), and some of those should not be for sale. One thing I’ve noticed, and not just looking at Ellora’s Cave’s books: the connection between All Romance eBooks and iBooks appears to be somewhat fragile. For Ellora’s Cave, this means that a significant chunk of their top-selling titles never made it to iBooks, including at least three Laurann Dohner titles. So, for someone who shops via iBooks on a regular basis, these books simply do not exist. Therefore, if you’re an indie publisher, I’d highly suggest you push to iBooks via Draft2Digital instead of ARe. iBooks is fussy, and D2D has far better error handling with fewer failure rates. Here is the spreadsheet listing Ellora’s Cave’s titles on All Romance eBooks. It’s readable by anyone, but it’ll make it easier for you to search and verify that any titles that should be reverted are in fact reverted. This is scraped straight off of ARe’s pages, so there’s been no post-processing to normalize the data. The Amazon data is post-processed and normalizes all known author name variations and title variations. Note that the author list for a given book matches (I hope) the current Amazon data for that book, but it may not match the cover, table of contents, or royalty statements. I have done the import, but I screwed up my first run, so I need to fix the rest of that before I release that info. I’ll likely update this post rather than create a whole new post. In happier news, today’s the release date for Naughty Literati’s Naughty Heatwave, a boxed set of quite a few romance authors including former Ellora’s Cave authors. You can read more about it here or purchase directly from these links: Amazon Kindle, Amazon print, iBooks, Kobo, Nook, Google Play, or All Romance eBooks. Ellora’s Cave has rebranded as EC for Books, so I’ll be using that in my headers from now on. I will keep the header graphic as it was, though. I’m torn about the rebranding for two reasons: often, a rebranding for a troubled company signals a new direction that only hastens its demise, especially in the tech world. On the flipside, the Ellora Caves are a sacred site in India, and it would be nice to let them have their google-fu back. EC for Books’s lawyer, Steven Mastrantonio, sent a letter to the Romance Writers of America (RWA). More Ellora’s Cave/EC for Books author attrition since last month. Susan Spann and the #PubLaw hashtag. I’d heard excerpts of this letter for a couple of days, but hadn’t seen the whole letter until Jan Springer posted it yesterday. Because of questions surrounding one paragraph, I didn’t want to post until I’d read the whole thing. RWA has no standing in relation to contracts between authors and Ellora’s Cave. Therefore, RWA’s role is limited to advocating for fair treatment of authors, and RWA has been in correspondence with Ellora’s Cave, repeatedly, regarding allegations that Ellora’s Cave has failed to make payments due and failed to revert rights to authors. Contracts offered by Ellora’s Cave Publishing state “Publisher shall pay Author royalties in accordance with a schedule to be determined at Publisher’s discretion but in no event shall payment be made less frequently than three (3) calendar months.” The problem with this clause is the lack of specified period for which royalties will be paid. RWA continues to receive complaints from authors who report they have not received royalty statements or payments for many months. I’m sorry, you have misinterpreted the contract the author chose to sign. Breach of clause 16 regarding royalties payments (or any other contract clause) does not void the contract nor revert book rights to you. When a contract is breached, the party claiming breach has the option of waiting for the other party to correct the situation or may pursue legal action to gain correction of the situation. In such case, the court would typically set a deadline by which time the situation must be corrected (“cured”), and if not corrected the court would decide on further action. The only conditions set forth in the contract for reversion of rights are in clause 1.1. If your book qualifies (meets all the conditions listed), you may send a request for reversion of rights, stating it is based on clause 1.1. Therefore your request for reversion of rights is not granted. Ellora’s Cave continues to hold all publishing rights to the contracted books. The author has no rights to distribute or sell these books in any format or channels. I am sorry, we in Contracts have no information on royalties payments. 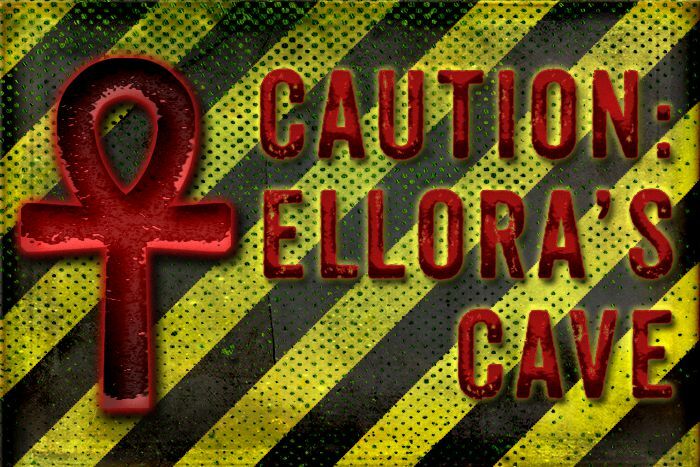 We can only advise you to email Royalties@ellorascave.com. In September 2015, RWA contacted Patty Marks who admitted “currently we are not as up to date with royalties as we want to be and will be,” and added that the company is trying to catch up. Failure to pay authors in a timely manner is a violation of RWA’s Code of Ethics for Industry Professionals. Violations of this Industry Professional Code of Ethics may result in loss of privileges such as (but not limited to) listing in Market and Agent Updates, participation in workshops and pitch sessions, and the opportunity to advertise in RWA’s publications. Allison Kelley notified Ms. Marks in September 2015 that Ellora’s Cave must refrain from contacting members or chapters regarding new submissions and refrain from participation in any RWA or chapter event until the company has achieved satisfactory resolution of the Code of Ethics violation. Ellora’s Cave continues to be banned from RWA programs and services. There is little anyone can do without proof. In September 2015, Allison Kelley contacted an auditor who specializes in royalty reviews to get an idea of what would be involved in order for the board to consider funding an audit. An audit would not be comprehensive—RWA could provide funding (in the form of a grant) to conduct audit/s for one or two author/s who requested to have earnings audited. Accounting records maintained by Ellora’s Cave would have to be auditable. In the past, RWA funded an audit, and all we learned was that the publisher did not follow any kind of standard bookkeeping or accounting practices. Sales were difficult to determine, so there was no way to prove if royalties had been paid properly or not. We saw how vigorously the attorneys for Ellora’s Cave fought to keep the books from being audited during the lawsuit against Jane Litte. RWA also requested legal advice related to authors’ rights to cancel agreements for ongoing uncured breaches of contract. We were told the issue would depend on Ohio state law, and the likelihood of success would depend on the outcome of an audit. Again, RWA has no standing to conduct an audit, and audits can only be done upon author request, and the findings would apply to authors whose earning had been audited. The remainder of the letter was the RWA’s policies on use of funds, which can be seen in Jan Springer’s post. In the past, RWA funded an audit, and all we learned was that the publisher did not follow any kind of standard bookkeeping or accounting practices. Sales were difficult to determine, so there was no way to prove if royalties had been paid properly or not. I don’t believe this was about Ellora’s Cave/EC for Books, but rather another publisher. I don’t know which one, though. Allison Kelley shared this with someone and I was given the okay to share. I have no idea if the accounting records at Ellora’s Cave are kept in compliance with GAAP and are up-to-date. Hopefully, they are. The comment cited below pertains to another publisher. I felt I had to include that disclaimer so authors would be aware that audits do not always yield the information desired. Where “cited below” in this case means the one I quoted above and commented on. The reason for the difference between Ellora’s Cave author counts and my data are simply that EC has already removed some authors from their site where their last EC books are mid-reversion. However, some of those authors may still have books available on Amazon and/or All Romance E-Books. If Ellora’s Cave/EC for Books reverts all anthologies except those published this or last year, that will drop their author counts by 153 authors. This isn’t a bad thing, though, because paying royalties for multi-author volumes chews up a lot of staff time that could be better used for, say, writing checks. Susan Spann’s a publishing attorney who posts about legal issues and publishing law. I just found her feed today, so I’m going through her feed, but this is one of the things she’s gotten the idea for because of claims like those of Ellora’s Cave’s/EC for Books’s authors. If you’re looking into traditional publishing (and I’m lumping in digital first here), she’s got a lot of eye-opening content that could be useful to you. Kerri Zane is one of the new EC for books authors; her first book with them came out this month. Here’s a profile of her launch party at a Porsche dealership in Beverly Hills. It’s unknown how much, if any, EC for Books contributed to fund this launch party.